The government of Peter Mutharika has been urged to check the failures of ESCOM or risk facing a popularity loss and a public resentment. According to Minister in the UDF regime who was also a minister, Clement Stambuli, the failure by the Democratic Progressive Party led government to check the power shortages that have become rampant with the ascension of DPP to power can backfire on the regime. “Government need to check on ESCOM and ensure that they are able to provide full service,” posted Stambuli on his Facebook page. Stambuli indicated that the power shortages in the country are affecting negatively production and thereby affecting the revenue that government will be collecting from the companies. He further said that in light of cuts in productivity, companies might retrench staff and make it worse for an economy that is already dogged by high levels of unemployment. Stambuli then chided the government, wondering why it was not borrowing a leaf from Mozambique that has a backup plan for power failures despite that the nation’s electricity providers are many steps better than ESCOM. Malawi has experienced the worst electricity cuts ever known in history this year. The electricity shortages started after the floods that happened in January. At that time ESCOM used the excuse that they had been affected by the floods. The problems have however continued persisting. Current President Peter Mutharika has since told Malawians that they should get used to the power cuts until 2018 because that is when the situation will be addressed courtesy of the Chinese government. ESCOM is one of the worse institutions where tax money are just wasted .black outs every day; president should not be blamed but opposition leader because he has his own pple who try to pull down government.we know them, they are there in ESCOM. Sazapezeka mtsogoleri wabwino kuposa amene analipo.tinkat bola bakili then bola bingu now bola j.banda kenako tizat bola peter. A Dpp mukundi dabwitsa.Mwalimbikirapo poti a opposition azikuuzani nzeru,inu munauzapo yani pomwe simunali m’boma.Nkhani ya mochale ku LL munkanyoza ndani?Lero ya magetsi muli Pitala sizikumukhudza.A opposition sakuuzani nzeru muuzeni Pita amenye mmutu mwakemo mwina prof.ayamba kuganiza.Prof. was a slow learner ndawona. It has nothing to do with President but the administration of ESCOM is to blame . How many political leaders are to blame? Nthawi ya Bingu magesi amavutavuta, nthawi ya Joice sanavuteko, nthawi ya Peter akuvutaso vuto ndi ndan DPP,ESCOM or THE MUNTHALIKA’S ? nde dpp mukut ionjezere madzi acepa mu lake malawiwo?ali nd mphamvu zobwerexa madzi nd jah jah bas. The proble is dat those peole who are working @ escom and some top class members of our nation they use to stay in areas where magetsi sazimazima as in our ghetos komaso amakhala ndi ma buck-up source of powr, so tikamalila aphawife amaonangati we are jorcking. Vuto Lamagesi Wapangisa Si Peter Mutharika Ayi Bvutoli Anachita Kulipeza.Koma Chifukwa Chandale Zopusa Zakumalawi ,tikuloza Chala Mtsogoleri.Koma Chimene Tingaziwe Ndi Ichi Peter Mutharika Anachita Kusankhidwa Ndi Anthu Mosogozedwa Ndi Mulungu ,ndiye Ngbkhale Wina Akuwe Motani Ameneyi Azachoka Pampando Nthawi Yake Ikazatha. Koma 2019 Ameneyi Ndi Owinawina Kale . inu nde mwatinamiza. did we start experiencing energy problems in Malawi yesterday?. come on pal. AREN’T WE SUPPOSE TO TAKE CLIMATE CHANGE ISSUES ON BOARD WHEN EVER WE ARE TAKING DEVELOPMENTAL PLANS? is the 300mw kammwamba project not an altanative for malawi? what about the lilongwe 40mw solar project? ndiye nkumat makampani azayambitse ntchito zawo ku malawi; magetsi ake ati? 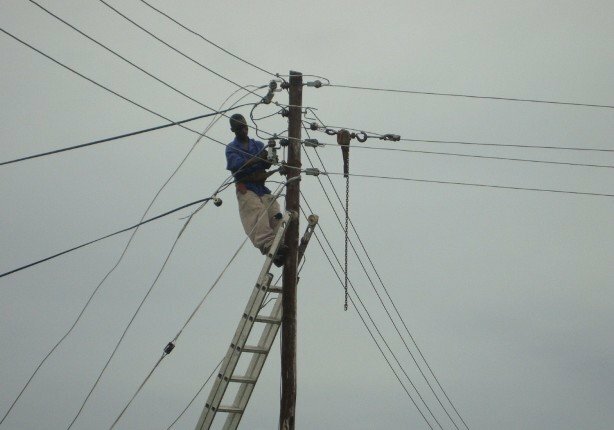 ESCOM 2 Ija ndimeneyi a ESCOM akuti ogwira ntchito pamwamba pa Line pa Pole ngati pamenepa opanda Uniform kapena kuti Ovolosi olo Work Suite moti ESCOM yavomelezadi kuti ndi ogwira ntchito wawo ameneyu osati gulu la ESCOM 2 lija tionetsetse bwino apa nkhaniyi ndiya ku 2. Fisi anakanakana nsatsi, zinaz tamaganizan musanaloze chala munthu. Ndiulamuli ut umene magets sankazma? Nkhani imangokhara tikufuna kuonjezera makina athu mkumakweza mitengo inu a escom. Makina ake ati? Popeza magetsi chizimilecho tikunena pano azimanso. Amapanga ma millions koma zimapita ku boma ,kudikilaso funding chaka china. Korma dpp ndie mumalimbana nao.kod peter kapena dpp amagwila ntchito ku escom? EVEN YOU MICHAEL YOU DONT THINK PROPERLY. DPP INAKUPATSA CHIYANI? anyone can establish their own media these days. just pick out the validities and leave out the rest. Admin eti ma Black’s angawana zida??? that’s not true for us to wait up to 2018 because you could tell us what you are doing as government to this problem but we always hear get used to tough times coming ahead. Mr president you are a leader we all see you give us the right direction don’t be coward otherwise we will perish. I heard you saying the president has more powers and its better to share, how can you work if you don’t have power see what is happening the one you share powers for us to have electricity is no where to be found but you are there watching while things like electricity is getting out of hand! we trusted you Mr President but you do show love to us why? sitikuyendera pamodzi. Makina amene akupanga mphamvu zamagetsi ndiamene anagula Ngwazi Dr. Hastings Kamuzu Banda masiku amenewo population ili yochepa. Pano maboma onse angogulira ma spares mmalo moonjezela makinawa. Akakhuta bibida amvekele Kamuzu palibe chomwe anapanga. Kuyambira UDF, DPP, PP zonse ndi mbuzi palibepo wachitukuko kumbali ya magetsi. and where has the so called Mr Stambuli been all this time. he better start doing before saying because the whole general public knows about these poor service deliveries. then what next? company ya makape iyi.atsogoleri akenso omva zawo zokha. Iwe magetsi anakakhala kuti asiya kuzimazimaku bwezi iweyo ukutamanda boma kuti lagwila ntchito pamenepa so why ukuti sizikugwilizana ndi boma? Kodi escom si nthambi ya boma kapena? A wakisa, how should they say it so you get a point? Escom is gov entity it runs on government policies/plans. So if the plans are failing who should we blame? THIS GOVERNMENT IS A FAILURE!!!!! Munavota nokha musakangane anganya inu,zilizonze Dpp pa..ntu…ndu…wanu munakhala bwanji mudatani inu!!!MXXXXXXM.. Ndi amai zinaatha izi sakudziwa ndani? DPP koma kusolola ndiye m’mati escom ikonza bwanji itatsala mafupa okha okha? kodi zikukhla bwanji thawi ya amai amkati akukoza ndipo magetsi anasiya kuthima lero kwalowa enawanso akuti akukoza kodi akumakoza zi chani?